Sourav Ganguly has lavished praise on Rishabh Pant for what he adds to the strong Indian team. At the same time, the former skipper has also pointed out some aspects where the wicket-keeper needs to improve himself, one of which relates to 'keeping the game simple'. In the first T20I match between India and Australia at Brisbane, Pant tried something out of the box but unfortunately got dismissed in a terrible fashion. India's loss in the first T20I meant that their hopes of a series win vanished when the second T20I was abandoned due to rain. 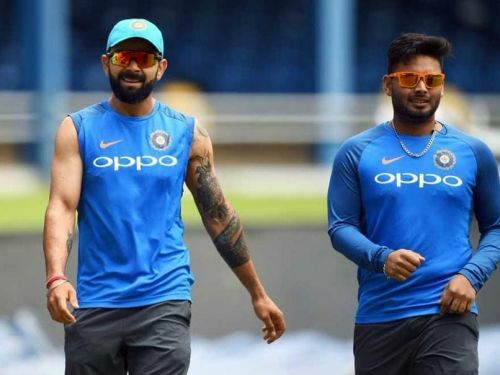 Pant's rash shot was the deciding factor in the first T20I, according to the former Indian skipper. Ganguly also affirmed that Australia were 'extremely lucky' to have won at Brisbane. In his column for Times of India, Ganguly wrote that the young wicket-keeper's ability to score runs all around the wicket was remarkable. He also labeled Pant as an exceptional talent and the future of Indian cricket. The erstwhile left-hander wrote, "The Australians should count themselves extremely lucky to have won at Brisbane. India was taking the game away when a poor shot by Rishabh Pant tilted things the hosts’ way." He added, "Pant is an exceptional talent and is the future of Indian cricket. His run-scoring ability, that too all around the wicket, is remarkable. But one thing he quickly needs to learn from his captain Virat Kohli, who is such a fine example of this concept, is how to keep the game simple. I am sure with time, Pant will learn." On the other hand, Ganguly also expressed his displeasure on the tight schedule for the T20I series which didn't ensure enough time for the players to recover, rest and freshen themselves ahead of the upcoming fixtures. The three T20I matches were conducted in the space of just five days. "I am indeed amazed by the schedule! Three games over just five days in Australia is tough, especially when flights are so long in Australia," Ganguly wrote.